I won't be selling the original until sometime in the fall and will announce that on my blog. Put on your thinking caps and help me come up with a title for this new snowman painting. Leave your title in a comment on this post and the lucky winner with the best creative title will receive an 8 x 10 inch print of this winter scene. If I don't receive a title that works, I will simply draw names to decide the winner. You have until Friday evening at midnight central time to enter. Frostyville? Frosty Hills? It came out really cute! Taking a snow day to build a snowman village! That's the best I can do....and I see Vee has thought of a cute title already! The Village of Snowmen. LOL. I love this Catherine, it is beautiful, but then I have always been partial to your Fall and Winter scenes, they always make me think of where I would love to live and if I could climb in one and liver there I would. Fantastic! The Village of Snowmen, LOL This turned out beautiful, if I could I would crawl in there and live there. I have always been partial to your Fall and Winter scenes. Fantastic!! The Town Snowmen! I love this painting! Hi Cathereine I havet been around for a while but I am just in time to enter your fabolous giveaway. You know, that english is not my language but I give it a try. Snowfall Heights, where every family, carrot-nosed or boot-shod, dreams of spending Christmas! To tell the truth, the perfect title has already been submitted: 'Snow-place Like Home' from thismustbe, May 28, 2013 at 7:11 PM. I can't imagine a better name for your delightful painting. I love your artwork. How about the print's name being Winter Village? Catherine, this painting is amazing. I'm sorry I'm going to be no help what so ever with the title...leaving that all in your capable hands. 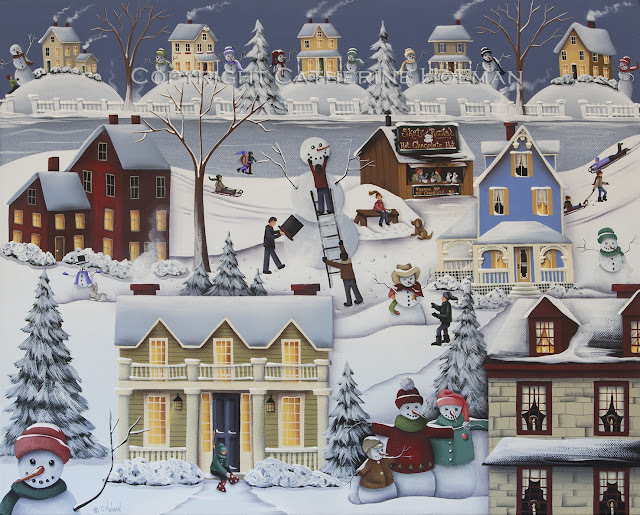 This beautiful painting reminds me of the Christmas villages from dept 56. It is really lovely. This is so lovely. It would be awesome as a cross stitch or needlepoint design. Needlepoint painted canvases are all the rage right now....it might be another avenue for you to market your wonderful art.